Popular Disney movies on DVD from the Disney DVD Movie Club! The Disney Movie Club is your source for Disney DVD movies that will delight viewers young or old! Featuring a wide selection of Disney's greatest hits on DVD including preschool, live action, animated movies, recent releases and hard-to-find Disney classics! 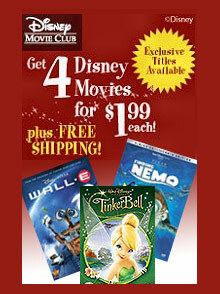 Best of all, get 4 Disney Movies for $1.99 each with your introductory membership to the Disney DVD Club! Your savings will be applied automatically at checkout on the Disney Movie Club website.